The Disorient logo is used on our Signs, D-shirt, Urn, Disorient Pattern, etc. 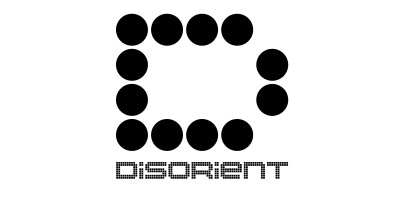 Every Disorient camper is encouraged to use the Disorient logo and the Disorient font for Disorient-related projects. Disorient logo and fonts should not be distorted in X or Y. Space between each 8 point letter should be one point (for instance if letter is 8 pixel tall, space between letters should be 1 pixel). The proportions of the letters, kerning, etc. should remain as shown on this page. Contact The Eye with concerns/questions. 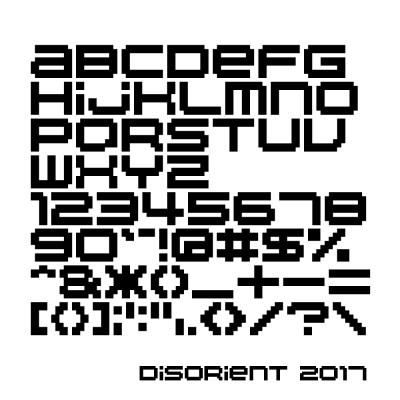 The "Disorient 2017" font (designed by The Eye and programmed by Jacob J.) is an update and a simplification of the Disorient font. In an effort to make the font more legible while keeping its distinctive character, many letters have been fine-tuned. Also, both upper and lower cases display the same character, so you really can't go wrong. We encourage the use of this font over previous versions. (Disorient 2017 font family) "This is an experimental version. It doesn’t validate when installed, but OS X will allow you to override it. There a few things broken with it but as long as you stay within the disorient character set you should be fine for now." -Jacob J. Designed especially for Bedouin Tech in 2014 (the year we launched our Dubai event), this font is used for the Disorient Dubai Sign and on Disorient Dubai artifacts. Similar to the idea of adding the year to the Disorient logo, the origin of a photo is immediately identifiable thanks to this font. In 2015, the Bedouin Tech logo was extrapolated from this font. This font is available as part of the Disorient 2017 font family.  The Disorient 2012 font is a significant departure from the previous versions of the Disorient font. The goal was to create a 4-point font while remaining true to the overall proportions of the Disorient font. Although some characters had to be drastically modified, this transformation was possible since most characters in the Disorient font are 8 pixels tall by 10 pixels wide, both dimensions resulting in a natural number when divided by 2. DO NOT USE. FOR REFERENCE ONLY. PLEASE USE DISORIENT 2017 FONT. 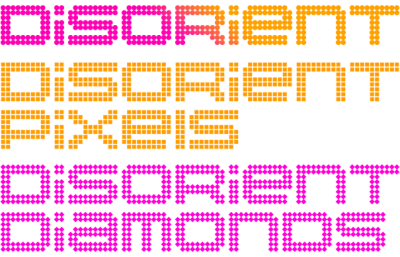 The Disorient font family includes the Disorient font, Disorient Pixels font, and Disorient Diamonds font. This font family is presented here for archiving purpose only and should no longer be used. IMPORTANT. 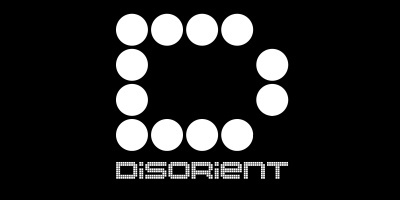 Since 2017 the Disorient logo uses the Disorient 2017 font family which has replaced the Disorient font family. Disorient Classic font: 04b-20 (Mac - Win). Every year letters of Disorient are replaced by the number of years Disorient has been around (which coincides with the last digits of the year). This convention, loosely based on 1337, started in 2004 in order to make years easily identifiable on photos. Below is a list of suggested spellings but there is no "right" place for the number(s) in Disorient so feel free to experiment. 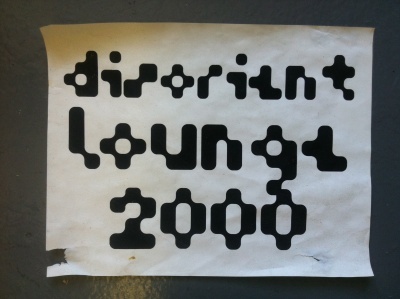 Disorient Lounge 2000 Sign, part of Tranquility Base at Burning Man, the year before Disorient became a camp. An example of the pixel font direction that led to the current choice of font for Disorient.